A Life without Anorexia: Why is having fat seen as a bad thing? Everyone has and needs fat on their body, it is essential for health and well being. Too little fat on your body and you will face consequences just like too much fat on your body will cause consequences. The word 'fat' however, has so many negative connotations rather than just an adjective. A describing word which is what it is. You have skin so why not call yourself skinny? Or hairy? Having fat on your body is not a bad thing, in fact it is needed. It does not make you ugly, imperfect (Note: there is no such thing as perfect), lazy, unattractive, stupid etc etc Having fat on your body keeps you warm and protected, there is a reason we have it on our bodies - we cant survive without. Far too many people are facing consequences just because they want to try to have as low body fat as possible. But that isnt maintainable as it often requires very strict diets or starvation diets combined with heavy and lots of exercise. This takes a toll on the persons mental, physical and social life as their whole world often revolves around their body, diet and exercise. Not going to social events, not eating with others or eating anything they deem as 'unhealthy' and spending most of their free time either sleeping from exhaustion or working out. Your body is clever though, it wants to have fat on the body to keep it warm and protected so it will fight back and try to hold onto the fat - hence why many people find that they 'struggle to lose the last bit of weight or tummy pooch' as they call it. Your body doesnt want to and ask yourself... do you really have to lose that weight or stomach fat? Because the truth is you DONT have to unless it is for medical/health reasons. Weightloss/fatloss doesnt have to be a bad thing, it can increase energy, healthiness, lifespan and confidence but it depends where on the scale you are at. If you already have a low fat procent then losing even more isnt going to do so much and can likely cause more negative effects than positive ones. You need to learn that body fat is not a bad thing. Everyone gets tummy rolls when they sit down or bend over. And no, you dont always have a flat stomach as you can bloat due to different reasons. Remember that you are MORE THAN YOUR STOMACH. MORE THAN YOUR BODY. MORE THAN YOUR APPEARANCE. Let go of trying to change your body. Let go of trying to lose stomach fat or have a thigh gap or look a certain way. Instead try to live life and find BALANCE in your life. When you dont have balance, when you overeat or under eat, overexercise or no exercise at all, continuously stress etc those things lead to imbalance and can lead to more anxiety, guilt, worries. That in turn leads to even more imbalance and you can feel the need to control things. If you learn to find what works for YOUR body - because we are all different. Find what makes YOU happy, what YOU enjoy doing in life. Focus on self love and increasing your self esteem if that is what causes you to feel so down about yourself or feel like you arent good enough. Because you ARE good enough. Try something new, do something spontaneous, live life. 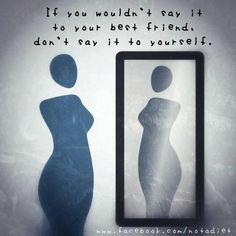 Dont look in the mirror for 5 days if you are obsessed with looking in the mirror, eat your favourite food, go for a walk, read a book, sleep in, cuddle an animal, talk with your best friend or family or partner. Start a new hobby, find a new interest, write out your thoughts, create a bucketlist...... so many things you can do instead of sitting at home and hating yourself and your body. You are more than your body and no you arent fat because you have fat on your body. Appreciate and love your body - YES, even your stomach rolls, cellulite and stretch marks. You are all beautiful just the way you are and you need to remember that. Find the beauty in others as well as yourself. Dont focus on the negative - if you just see the ugly in other people and other things then you have got to work on yourself and your thoughts, because that is a pretty tragic mindset. If you instead find beauty in everything you see and other people around you it creates positivity in your mind and is the first step to thinking positively in other situations.